ConceptDraw OFFICE and the ever-growing collection of product extensions in the ConceptDraw Solutions provide ultimate flexibility and user-friendliness in a robust, full-featured business productivity suite. 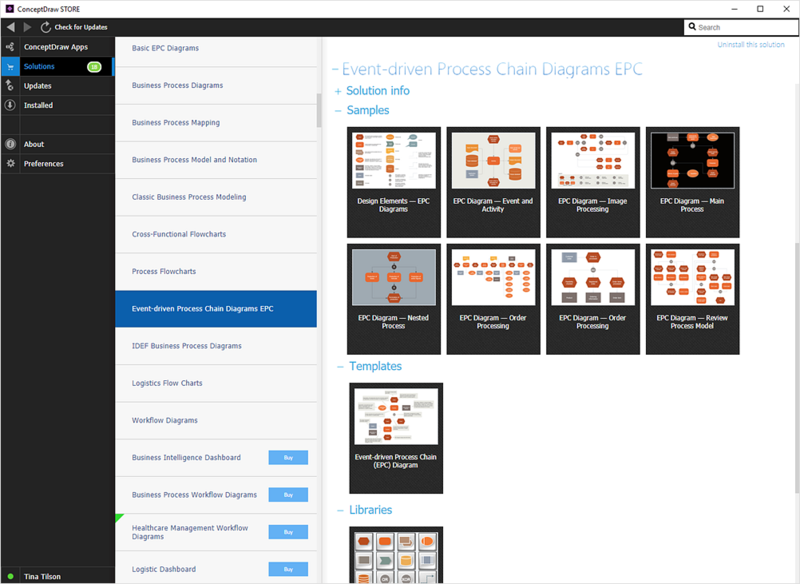 ConceptDraw Solutions collect graphics extensions, templates, and samples designed to provide productivity increasing solutions for all ConceptDraw products. STORE provides a number of solutions to download that supports various issues and can help you to solve your business tasks. Along with solutions that are free of charge, ConceptDraw Solutions contain paid content designed to designed for specific professional needs, that can be also purchased and downloaded via STORE. You can see Information related to selected solution in the Solution info section on the right panel of ConceptDraw STORE window. You can search for required solution. You can see the number of new solutions that are not installed on your computer yet. Solutions tab displays a list of all ConceptDraw solutions and possible operations depending on the license status. Solutions that you have not viewed are marked with a green triangle . “Install” - You can download and install a free solution. “Buy” - You can start buying a paid solution. If you have ConceptDraw solution already installed, you can preview its full content on the right panel. You can easily access stencil libraries, templates, and samples directly from the ConceptDraw STORE. By clicking the corresponding preview icons.